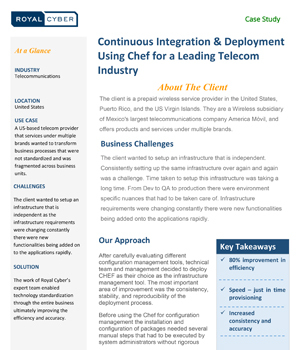 A US based telecom provider that services under multiple brands wanted to transform business processes that was not standardized and was fragmented across business units. The client wanted to setup an infrastructure that is independent as the infrastructure requirements were changing constantly there were new functionalities being added on to the applications rapidly. The work of Royal Cyber’s expert team enabled technology standardization through the entire business ultimately improving the efficiency and accuracy.